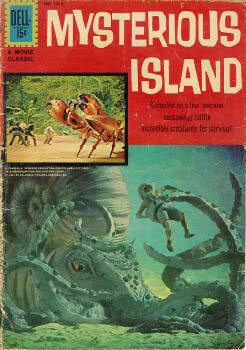 The Mysterious Island, by Jules Verne, was inspired by the balloon technology developed by Thaddeus Lowe. So, where was the science fiction of the nineteenth century, if Frankenstein was so influential? It existed, but it followed “Sturgeon’s Law” [credited to SF author Theodore Sturgeon] in that most of it wasn’t very good. In fact, Mary Shelley herself wrote another volume that could be considered science fictional, and the reviews were mixed at best. Her novel The Last Man was possibly the first post-apocalyptic novel in the modern sense, about a man surviving after a plague had destroyed most of mankind. Critics didn’t especially like it, and while it has been reprinted in modern times, it’s not considered a great classic either of literature or science fiction. While major authors, ranging from Victor Hugo to Edward Bulwer-Lytton [the latter the source of Snoopy’s “It was a dark and stormy night” line] wrote novels that had elements of science fiction, much of what was coming out in the way of early science fiction was in French, and not translated into English to any degree. The economics of publishing mass editions led to cheap versions of mediocre stories as well, many of them in the “dime novels” of the nineteenth century. Authors were paid poorly, and they cranked out tales that were sensational but not very good. Steam-powered robot horses vied with even less practical science for the dimes of readers. Of the better writers of the nineteenth century who wrote science fictional tales, H. G. Wells and Jules Verne are two of the better-known now. However, at the time their works appeared, they had numerous imitators, usually of lower quality. For instance, when Wells published his War of the Worlds, an American sequel starring Thomas Edison was immediately written by astronomer Garrett Serviss, and serialized in the U.S. Edison’s Conquest of Mars was not great literature, though, and didn’t come out in book form until the 1940s. 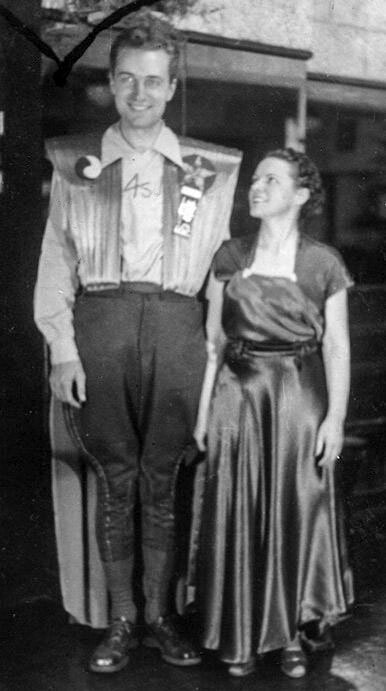 Forrest J. Ackerman and Myrtle Douglas wearing costumes inspired by The Shape of Things to Come. Verne and Wells eventually had connections to the development of science fiction media and fandom, as they created works later adapted to film, radio and television, as well as comics. What people may not have noticed was the connection between Verne and Pasadena. Two of the novels by Verne were based on his misunderstanding of the balloon technologies developed by Thaddeus Lowe. Thus, both Five Weeks in a Balloon and The Mysterious Island were inspired by the works of a real man, the same one Mount Lowe is named after. Verne got the balloons wrong, though. Wells influenced both movies and science fiction fandom in many ways. Almost a century ago, there was a film adaptation of The First Men in the Moon, although apparently no complete copies of the film still exist. One of the later stories of Wells, The Shape of Things to Come, was made into a 1930s film, one that caught the attention of the new generation of science fiction fans. It was this film that inspired two Los Angeles fans to create and wear costumes to the 1939 World Science Fiction Convention, the first of its kind, all the way across the country in New York. Those two fans, Forrest J Ackerman and Myrtle Douglas [“Morojo” to her friends], created the costume-wearing, or “cosplay” enjoyed by fans today.